Want the Klon sound but don't want another mortgage? This is for you. Sounds excellent. Highly practical. Solidly built. Smaller than a Klon. Sort of looks familiar, doesn't it? If you've ever lusted after the fabled Klon Centaur Professional Overdrive you'll no doubt recognise the vibe of the Archer stompbox immediately. J Rockett Audio Designs is the company that worked with Klon designer Bill Finnegan on the first versions of the post- Centaur KTR model. In short, Finnegan resolutely won't build any more Centaurs, so Rockett Pedals has gone ahead with this, the Archer overdrive/boost. "The Archer offers a remarkably amp-like experience that adds width and fatness to any kind of guitar"
One immediate surprise with the Archer is how small it is. One of the great downsides of the Centaur - apart from the comedy used prices - is that no matter how cool it looks, it does take up a lot of pedalboard space. Not so here: slightly smaller than a Boss compact pedal and secured in a solid steel box, the Archer fully befits its Tour Series status in that it's super practical and, by looks of things, seems virtually bombproof. Ins and outs are all on the front edge including the Boss-style nine-volt barrel jack; if you want to change the battery, you have to undo four very easy-to-lose screws. The internals aren't exactly the same as the Klon Centaur but the two-op amp/ germanium clipping diodes/ voltage charge pump/ buffered circuit format is present and correct. There's no physical dual-ganged gain pot, while the components are surface- mounted on a custom circuit board, including the jacks, pots and mains adaptor socket. The switch sits on its own separate board - easy to replace if it goes on the fritz. If you check out the video above you'll be able to watch a slightly tongue-in-cheek comparison of the Archer and a Klon Centaur (as part of the Tones For Tache Series). The bottom line is that they sound very similar indeed - perhaps the Archer is a tad more throaty/thicker than the Centaur and that our particular Centaur does aggressive, biting treble slightly 'better'. We're really talking a gnat's whisker of difference, however. They're very, very similar. The bigger story is that as a clean boost into a decent valve amp, a booster for other pedals or a low-gain overdrive, the Archer offers a remarkably amp-like experience that adds width and fatness to any kind of guitar. While there's a definite midrange kick, it's nothing like an Ibanez Tube Screamer in either EQ or compression. Quite the opposite in fact, as it seems to open everything out in terms of dynamics. There's also definite bite, but not the edge (nor gain) you'd expect of a Fulltone OCD, for example. 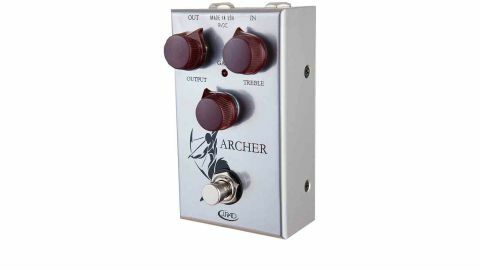 The Archer is a great-sounding overdrive-boost that's simple, highly practical and solidly built. There's a slight bad taste that it's essentially a clone of a previous design, but given that the originals aren't made any more and we players are crying out for them, perhaps JRAD deserves a break. There are other Klon clones out there (look out for a coming feature), but none with such a direct connection to the original.